Our Executive Director at Wesley Court, Cheryl, has given her 30 days notice. Those of you who know me and connect the dots, this is also my business partner with our B & B, Journey's Inn and my dear friend. I wrote Journey to Joy yesterday more for me than for anyone else. Sorry, but it's true. Ever since I learned that Cheryl was resigning, I've just been a little blue. 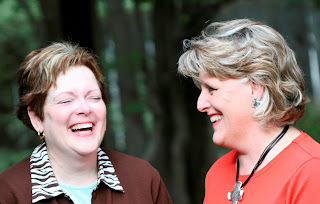 Cheryl and I talk all day, most days, and we laugh a lot at work. The uncertainty of the next step looms. Who will replace her position? What will they be like? Will they like to laugh? Of course, Cheryl and I will still see each other a lot, I sure hope, but it will change. I am absolutely and positively happy for her. This resignation from this job had to happen. Her husband's businesses need her attention, her kiddos need her and she needs to travel to Louisiana a lot to see her parents. I'm just sad for me right now. We have the best team of managers at Wesley Court and to be honest, we are all grieving a bit right now. She's been our hub at work. So, since I feel a bit sad, it's time to take my medicine. Gratitude countdown. ~The the air conditioner is supposed to be fixed at Journey's Inn before our guests arrive on Thursday!